The activation of our DNA template divine seed blueprints is a critical step in the process of ascension and in scientific terms DNA is a molecule of heredity, a nucleic acid located in cells that contains the genetic instructions used in the development and functioning of living organisms. Scientists acknowledge that we currently only use 3% of our 2 strand DNA. The rest of the DNA is still thought as “junk” in scientific means. However, the science is slowly getting nearer and nearer in understanding the roles of this DNA regarded earlier as “junk”. 12 Strand DNA Activation and energy healing help restore your DNA strands, restoring your original Divine blueprint to the highest frequency holding potential which in turn expands your consciousness to it’s fullest ability. The 12 Strand Diamond Sun DNA Template is the potential encoded in human DNA which allows humans to embody 12 dimensions of consciousness. For the Indigo’s various templates exist, allowing 12 to 48 dimensions of consciousness. There are three types of Indigos. Indigos Type 1 and Indigos Type 2 carry dormant within their cellular memory the heritage of the Oraphim ancestry, which is a forward DNA template. Indigos Type 1 have a 48 Strand DNA Template, while the Indigos Type 2 have a 24 Strand DNA Template. They began incarnating in preparation for the Stellar Activation Cycle that is currently in progress. Indigo Children Type 3 have a maximum of a 12 Strand DNA Template. They are from the Noah-Abraham-Moses-Nibiruian-Nephilim-Jehovian-Anunnaki-Illuminati lineage, who entered the Emerald Covenant for DNA Template Bio-Regeneis in 1875. Indigo Type 3’s have a dominant human Oraphim soul co-sharing the body with a Fallen Annu-Elohim Pleiadian-Nibiruian Nephilim soul that is in reverse. The point of two souls sharing one body is to restore the missing 12th DNA strand that is missing from the Anunnaki DNA template. It has also been said that a Type 3 Indigo has the ability of transforming their DNA template from a 12 strand, to 24 or 48 strand DNA template. It is extremely useful to know if you are an Indigo and what Type of Indigo you are. These activations are essential to the process of awakening to your Indigo nature as these activations align you to your true soul purpose on Earth. Knowing this helps you understand why you are on Earth at this time of evolution. There are 10 etheric strands available for each human, aside from the 2 strand DNA in each of the chromosomes. Each of these strands make it possible for a person to accomplish more and greater, since each DNA strand corresponds to a dimensional frequency band of consciousness. Activating all 12 Strands of your DNA is absolutely essential to achieving expanded consciousness and experiencing higher dimensional levels other than just 3D. DNA Strand 1: Courage to move ahead and integrate our fears. DNA Strand 2: Ability to focus on something and follow it to completion. DNA Strand 3: Maintaining gender balance between male/female power. DNA Strand 4: Balance between our energy field and the physical body. DNA Strand 5: Living peacefully in a state of acceptance. DNA Strand 6: Strength to stand in one’s truth regardless of the outcome. DNA Strand 7: Ability to accept both our dark and light sides. DNA Strand 8: Ability to hold personal boundaries regardless of outcomes. DNA Strand 9: Ability to accept and live within a diverse community. DNA Strand 10: Ability to tune into and listen to one’s soul or higher self. DNA Strand 11: Power to envision, create and manifest these visions in 3D. DNA Strand 12: Ability to be accepting, kind and appreciate the value in all things. Hypothalamus – I translate what I believe. Pineal – I see or envision what I receive. Pituitary – I hear what I receive. Thyroid – I speak what I receive. Thymus – I clear and transmute what I receive. Heart – I feel what I receive. Gonads – I create and manifest what I receive. Adrenals – I hold true to what I receive. Right now most people have only 3 to 3.5 of DNA strands activated allowing a maximum of 3 dimensions of consciousness. The process of DNA Activation also restores distortions in the DNA fire letters (scalar wave programming) in your chemical DNA. These distortions cause DNA sequences to run in reverse causing chaos in mental and emotional bodies. Most people have distortions in strand 2 (which relates to the emotional body), and strand 3 (controls the mental body). When DNA activation happens life comes up with much more clarity and harmony instead of drama, chaos, unhappiness, stress, and difficulties in experiencing genuine love. Most people do not know their life purpose and are just drifting in their lives. Furthermore, people are very disconnected from their REAL Selves and Universum and most people need to meditate or do yoga for many years to feel any energetic experience or a moment of higher state of consciousness. In reality it is people’s birthright to live without drama, with an excellent health, full of energy, joy and inner peace and live a life where each person knows what his/her life purpose is and each person can experience advanced psychic abilities where consciousness can arise and experience multidimensional awareness. DNA activation helps to start activating these abilities which each person already has, yet they are dormant. The goal of physical, emotional, mental and spiritual evolution is to progressively activate DNA to bring in and embody 12 dimensional levels of consciousness and merge with the ONE Source consciousness once again. To activate our 12 strand DNA template divine seed blueprint means that we are able to change the angular rotation of particle spin within every particle and sub-atomic particle that makes up our bodies to be able to ascend to another dimension. If you have energetic blockages such as auric attachments, karmic imprints, DNA distortions, or unnatural energetic seals and implants, then you will not be able to speed up the particles and accrete the frequencies necessary to live a life fully and in love and joy, to realize your true Self and find the purpose of your Soul and what work you are passionate in which to serve. 1st session) DNA preparation and DNA Activation Strands 1 – 4: the first DNA activation session where the chakras, brain centers and DNA template is prepared and cleared and strands 1 – 4 are activated, meaning restoration of the original function of the DNA of the strands 1 – 4 and the corresponding chakras. 3rd session) DNA Activation strands 9 – 12: which correspond to higher consciousness progressively activating your higher dormant strands of DNA through the multiple stages of DNA Ascension sessions (Strands 4 – 12) we are re-establishing your original divine potential towards 12 Strand DNA Activation. Basic is the 12 Strand DNA Activation Sessions. These sessions activate your dormant strands of DNA starting from strands 1 – 4. 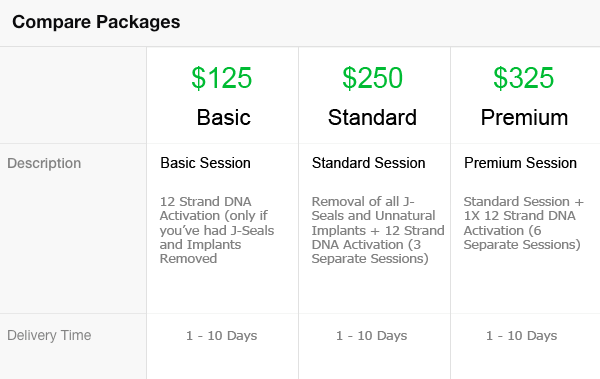 Standard is the 12 Strand DNA Activation Sessions and J-Seals and Unnatural Implants Removal Session. This session is designed to remove all of the various energetic blockages and accelerate your DNA activation process. Premium is the J-Seals and Unnatural Implants Removal Session, 12 Strand DNA Activation Sessions and a 60 minute intense Reiki session that will also help move additional stagnant energy through your system and clear you out for the new energies that are coming in. Will allow you to re-wire your energy conduits for expansive light accretion into your morphogenetic field so you can start having access and embodying your Soul Identity. Not only will you be able to embody more of your Higher Self, experience higher states of consciousness, you can start to live a life in ever deepening peace, genuine love and joy that is within you. Also your world outside as a reflection of what is inside will gradually change and your life may become more simple, relationships will be deeper and meaningful and your work may change to something that your soul is passionate about. It is recommended to do the J-Seals & Unnatural Implants Removal Session if you have not had this done before. These are 45 minute sessions that are separated a minimum of 7 days apart from each other. The reason why is the energies you will be receiving are extremely powerful and your higher self will filter them out to a level that which you are able to hold each day. DNA activation is a process of transformation. It takes time to activate your physical DNA. Etherically all 12 of your DNA strands for your divine seed blueprint will be activated, your body requires time to re-code, re-wire and re-structure your entire light body. Jaye splits up the sessions based on how many strands you would like to activate, which allows for time in between to integrate. I think this is really necessary because the energies stirred up the undressed emotions that I needed to process. I received 3 sessions in total. By the third, I was so high in vibration that I couldnt close my eyes during the session. I was alert and downloading ideas. Im very curious to see how this work will continue to impact my life. Its been an amazing ride so far and I certainly do recommend it for anyone who is serious about their growth! I would recommend it. I had a lot of clarity and a lot of energy from these 12 dna activations. There’s a reason for all these different session prior to this one. Otherwise the result will not be as strong. So worth it. If all-level healing and transformation are your goals, Jaye Pause is the one to help you! It’s been a few months since Jaye’s personal work with me, and yet I’m still in the process of change. If I were a butterfly, I’d say I’ve worked myself out of the cocoon and am resting, drying my wings… asking myself some serious questions about which direction to go once my wings are ready for flight. I got a cool color show behind my eyelids during the session. It felt like things were being plucked from various areas (caused teeny jumps or jerks), tingles and pulses of energy. Interesting … during the following week, I got a cold for the first time in forever. Things were definitely being cleared. During the session, I saw clockwise swipes of yellow/mostly green… some purple for a few minutes. A few muscle twitches throughout… Pressure in my head and ears, eventually moving down to my throat area feeling very “full”. The rest I just remember feeling very tired. The withdrawal of energy (or halting of the session) was very noticeable. Afterwards, I took a long hot bath. After that, I felt refreshed. During this session, I felt a couple little pain taps in the left ovary area and some lower lip & jaw tingles/trembles… plus saw more color swirls. At the end of the session, I got a very “floaty” feeling… very noticeable. I can tell I’m changing… letting go… moving forward into new areas, allowing new experiences… I’ve felt so stuck for so long that feeling the restraints being taken off is wonderful. I felt a lot of peace. While I was laying down, I felt wide awake, but when I got up, I felt like I was in another world… kind of stumbly, in a dreamy state. Then when I did the visualization afterwards, I think I went almost invisible LOL! I got some physical chores done in order to “get grounded” and that worked just fine to “come back”.. Very cool experience. I had some tears and emotional connections on this one. I started to feel a bit of overwhelm here, like I had all the change I could handle for now. Major transformation definitely in process… I almost feel like a blank space, or perhaps an arrow … being pulled back on the bow … I feel like I’m at that critical place where it’s almost pulled back enough to aim and launch… but I’m not there yet. Very tense, to be sure. Thanks Jaye – Great work! Jaye is an amazing healer!! Five stars all around for his knowledge, his caring, and his compassionate demeanor. This was my first of 3 dna activation sessions & I am looking forward to the next two!! This was my first Reiki experience ever and I’m so glad I picked Jaye! From the beginning he explained the entire process including what to expect during and after. He was such a pleasure to work with and genuinely caring for your well being. During the session I felt warm healing tingling all over my body. I would absolutely recommend him. A wonderful experience for the 12 Stand DNA Attunement! I felt my heart energy centre pumping and felt very relaxed and calm throughout the session. It is an absolute joy to be attuned to these powerful energies and I highly recommend this to others for their growth. Jaye really knows his knowledge and was there for every question I had. TY! Wow! Jaye has amazing knowledge and will support you through every step of the way, even after your session! highly recommended. He is a powerful healer and an absolute gem. Looking forward to getting more sessions with him! First session was great! Was hoping for a lesser reaction from a physical stand point as the J-Seal and Implant removal session was VERY strong for me and the effects of releasing old energies and patterns lasted just over a week. So far, I’ve noticed only positive things – like, my ankle pain has completely disappeared and …! Time will tell.. I am happy with how easy payment could be made via PayPal and communication with Jaye has been prompt and clear. Looking forward to my gig Part 1 of 3 sessions completed… I will make comment once all are completed. Thank you Jaye. Excellent as always!